The winning combination of a homeowner with definite ideas, a cooperative architect and builder, and an exquisite seaside site makes this Debordieu retreat the epitome of comfortable coastal living. Text: Lee Ann Carter. Photography: Ted Borg. Interior Design: Faye Harrington Altman. Architecture: Steve Goggins. Landscaping: Patrick Pernell. Builder: Ron English. A seaside community with plenty of amenities to keep two active teenagers busy attracted this family to Debordieu Colony. “I was looking for an area not too far from our primary home in North Carolina. I also wanted a place that was on the water and had lots of fun things to keep my children occupied,” the owner says..
Ron English, Vice-President of Construction for Paragon Builders remarks, “This home was challenging through and through but it was also a wonderful experience. Anytime we ran into a design vs. construction problem, the owner was very receptive to corrective solutions.” For example an important part of the family are the dogs, A Boykin Spaniel and a Lhaso Apso. Since the dogs are crate trained, a space was needed for their kennels and accessories. English custom designed and built into the laundry room cabinetry dog kennels complete with cultured marble shower pans for easy cleaning. “These dog crates were a great idea and the dogs love them,” says the owner. Designed as a techno/smart house, all lighting, heating and cooling, and security can be controlled via phone lines while either at Debordieu or from North Carolina. For example, returning for a sunset cruise, the boat lift dock lights can be activated with one cell phone call. This owner desired a casually comfortable coastal second home with an emphasis on easy entertaining. From the main level rear covered porch overlooking the marsh, clearly defined areas flow from multi-level upper decks all merging together effortlessly. The zero water line pool designed by Pernell and built by Aqua Blue Pools frames an open gazebo. A Gloster teak table and chairs casually arranged in front of a wood burning fireplace are perfect for outdoor dining. Presenting another design challenge was the owner’s request for a fully functional outdoor kitchen. Building materials were required to be durable as well as visually pleasing. Ipac wood, normally an outdoor floor decking material was used in constructing the kitchen cabinetry. Stainless steel appliances include an icemaker, dishwasher, and refrigerator along with a Viking grill, wok, and warming drawer. Again, for durability, custom outdoor lighting fixtures were fashioned with powder-coated stainless steel shades. A screened outdoor dining area is easily accessed from both the interior and patio kitchens. 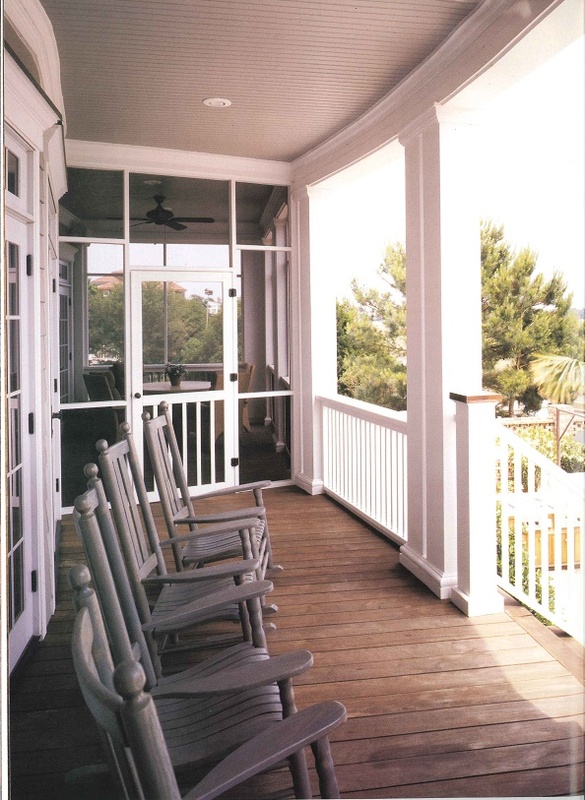 Old fashioned rocking chairs are the perfect spot for enjoying the water views. Clad in Eastern cedar white shaker siding, accented with hand cast brick, and using traditional Lowcountry staircases, Googans describes the overall home design as eclectic shingle style. 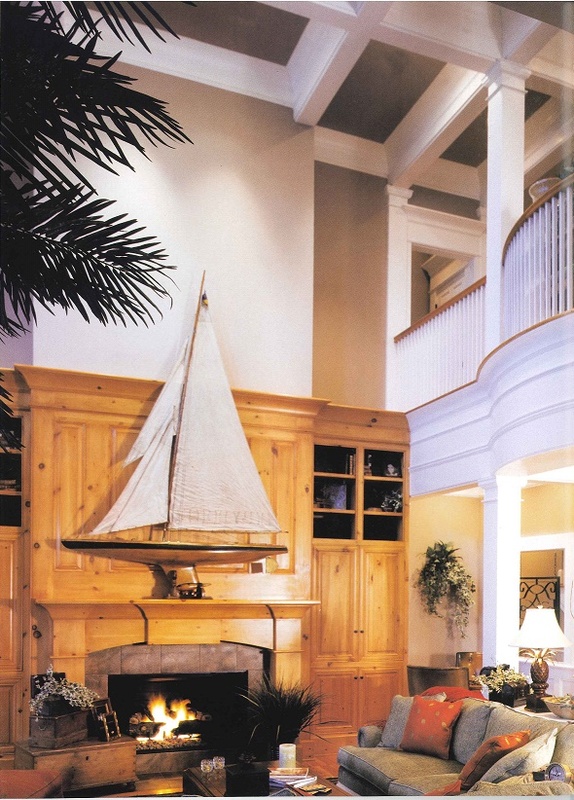 An antique hand-carved pond yacht circa late 1800’s is prominently displayed on the custom knotty pine mantel. Sanford upholstered sofas and chairs in soothing sages and rusts frame the cozy fireplace. 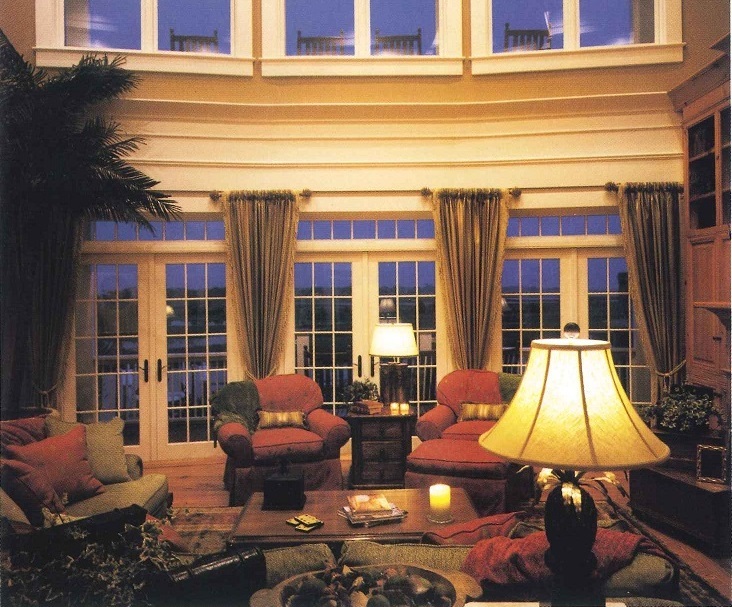 Window treatments from Old World Weavers frame the living room French doors. Custom cove molding between the second level wall of windows, living room French doors, and transoms add a unique visual effect. Designed with a user-friendly flow for entertaining, the breakfast room and dining room are separated by a functional and stylish kitchen. Knotty pine cabinetry, again designed by Classic Touch, is topped with Uba Tuba granite and a slate backsplash. The Uba Tuba granite chosen has a slightly different coloration than most Uba Tuba and only four slabs were available. “That made the job a bit tougher; there wasn’t much room for error,” Says Altman. Travertine was selected for the center island. All these different textures create a unique look and work well together. 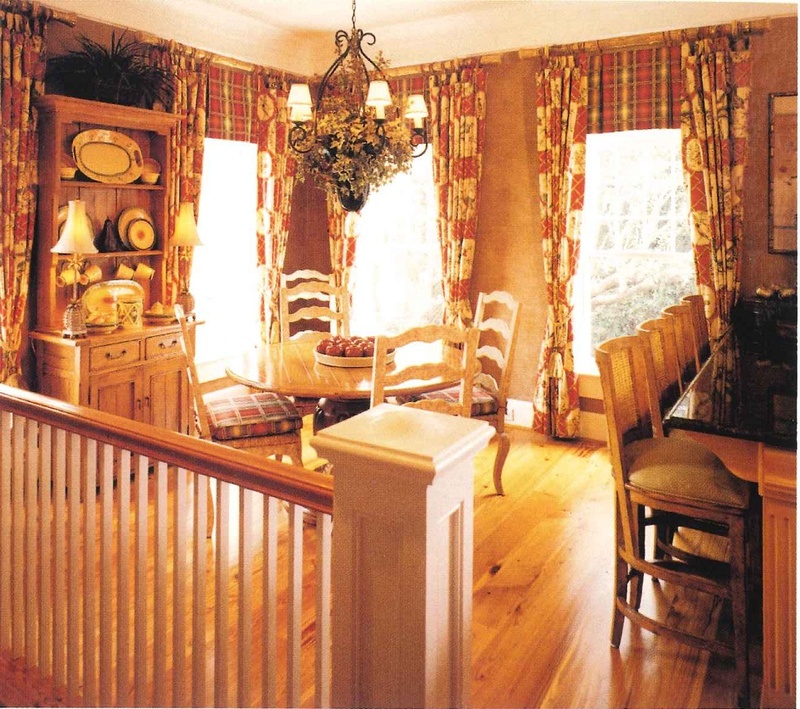 The breakfast room is reminiscent of one in an English country estate with varying shades of rust, sage, gold and khaki found in the Freemark chair seats and Schumacher window treatments. 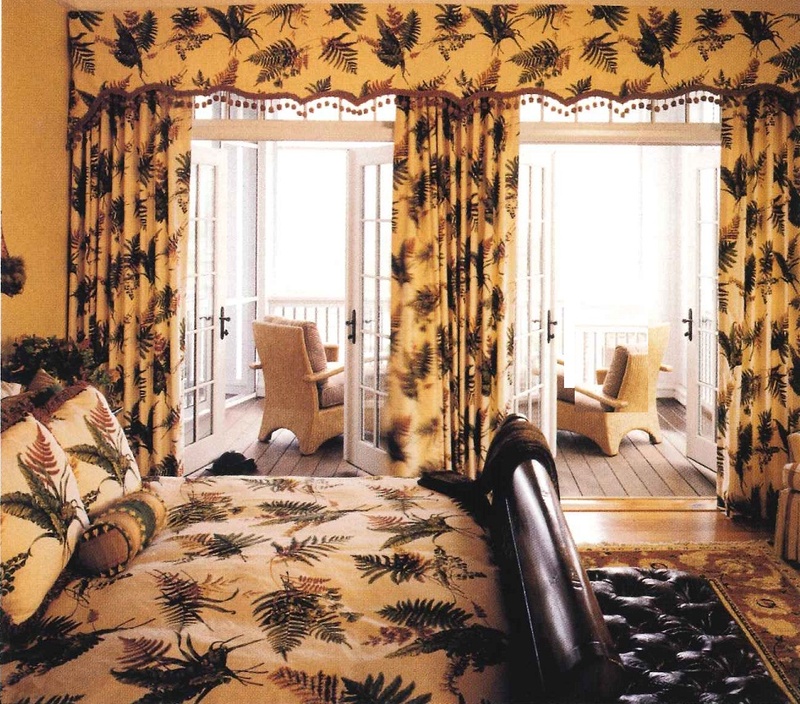 The main level guest suite is painted a relaxing shade of goldenrod, with bedding and window treatments by Old World Weavers. The breakfast room, kitchen, and dining room blend varying shades of black, gold, sage, khaki, and rust in the wallpaper, window treatments, and chair fabrics. Lee Jofa and Schumacher fabrics cover the dining room chairs and highlight the color palette of the Thibaut window treatments and cottage green walls. The rest of the main floor is home to a guest master suite and an additional guestroom. A subtle nautical theme carried throughout the home is seen in the bow-shaped second floor interior balcony. 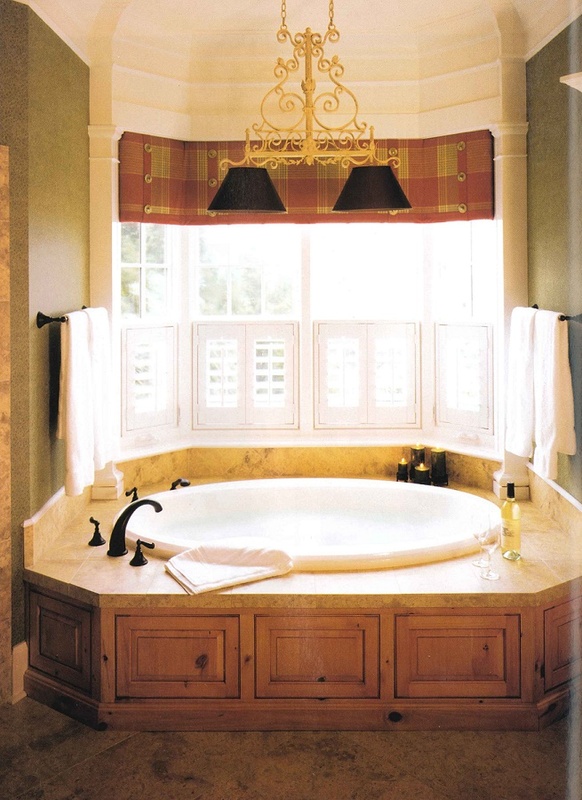 The master suite soaking tub rests on terra cotta porcelain slate. 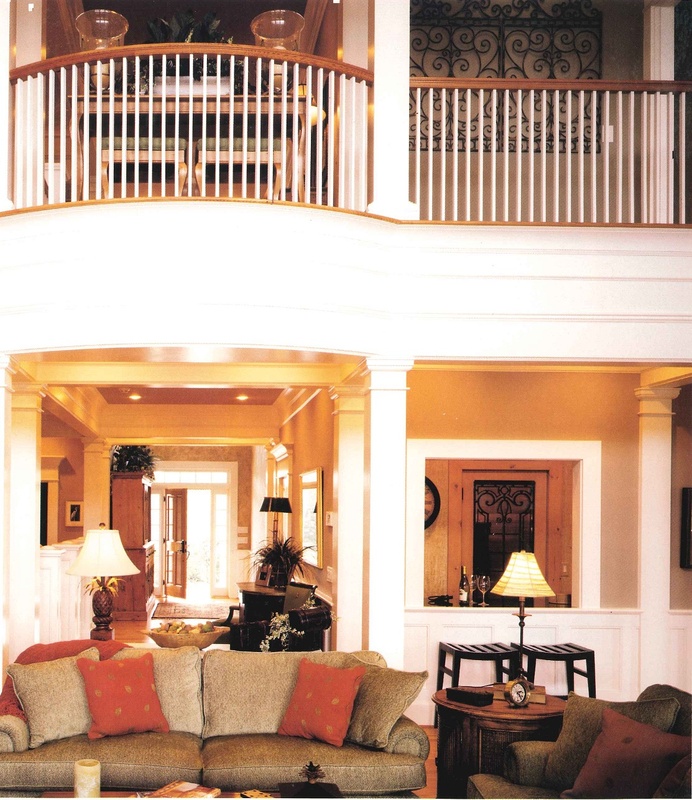 On the second level are the children’s suites, their entertainment room containing a computer center, the owner’s study complete with a fireplace trimmed out with the same cove molding seen throughout the home, and the primary master suite. This master suite includes a fireplace, his and her dressing areas, double vanities, and serves up a spectacular view of the north Inlet. Top left: Two hand carved pine Arte De Mexico chandeliers are antique finished to blend with the heart of pine floors and knotty pine cabinetry. Top right: From the spectacular rooftop deck, the view is unhindered and far-reaching – all the way to the Atlantic Ocean! Bottom left: An antique wrought iron gate has found new life as an objet d’art wall hanging. Bottom right: Designed for entertaining, the rear patio has a fully functional outdoor kitchen dining gazebo, and rimless pool. Inside the third floor elevator alcove, a staircase leads to the spectacular rooftop deck. Goggans had originally envisioned a cupola leading to the roof. When height restrictions wouldn’t allow its construction, he had to do some creative thinking in order to gain roof access. Goggans designed a conventional staircase leading up to a stainless steel roof hatch. Push one button and the motorized hatch rises up and access to the roof deck is gained. With an Atlantic Ocean view, comfortable cast iron chairs and ottomans by Pompeii, a surround sound stereo system, discreet outdoor lighting, and easy access to the third floor powder room and wet bar, it’s clear to see why once the idea of a roof top deck was discussed it had to become reality. 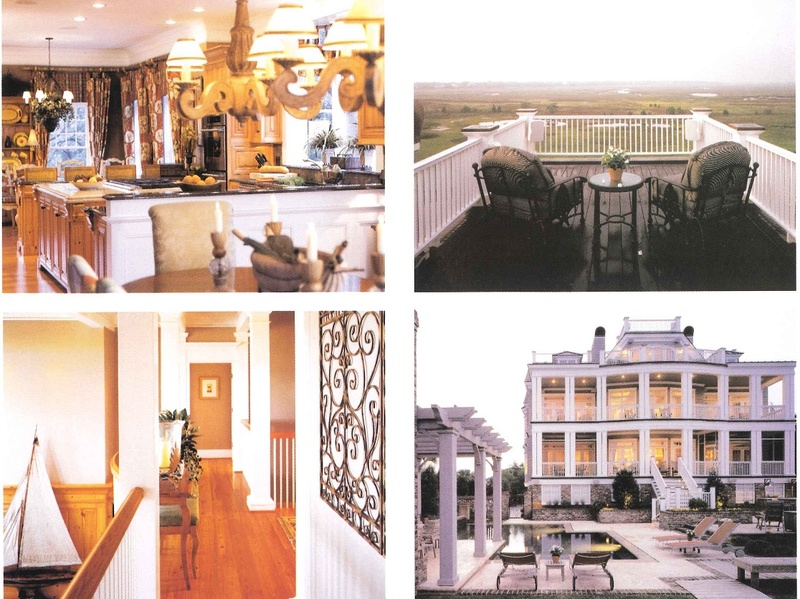 This Debordieu dream home is a prime example of what can be accomplished when everyone involved is open and receptive to overcoming the challenges custom home building brings to the table. This owner and her family have certainly found their coastal comfort here. This entry was posted in Carolina Homes & Gardens, Magazine Articles and tagged Aqua Blue Pools, Bill Blakely, Boykin Spaniel, Classic Touch, Debordieu Colony, Faye Harrington Altman, Harrington Altman Interiors, Lee Ann Carter, Lhaso Apso, Paragon Builders, Patrick Pernell, Ron English, SGA Architecture, South Carolina Homes & Gardens, Steve Goggans, Ted Borg on November 5, 2015 by Lee Ann Carter.